Cats are just like us: They love to kick back, relax and ... listen to music? At least that's what one psychologist thinks. Charles Snowdon, Ph.D., of the University of Wisconsin–Madison says that cats enjoy " species appropriate music," or music that reflects the kinds of sounds felines like to make. "We looked at the natural vocalizations of cats and matched our music to the same frequency range, which is about an octave or more higher than human voices," Snowdon told Discovery News. You can listen to some cat music, which also includes sounds like purring and chirping, here. Don't be surprised if your cat loves this feline funk: When Snowdon and his team played the cat tunes for their test subjects, the kitties reacted by rubbing their faces against the speakers and purring. But when they heard regular human music, they had no reaction at all. Cat music isn't just for fun. Snowdon hopes that in the future it could be used to relax and entertain shelter cats, or to keep lonely cats company while their humans are away from home. Who knows? 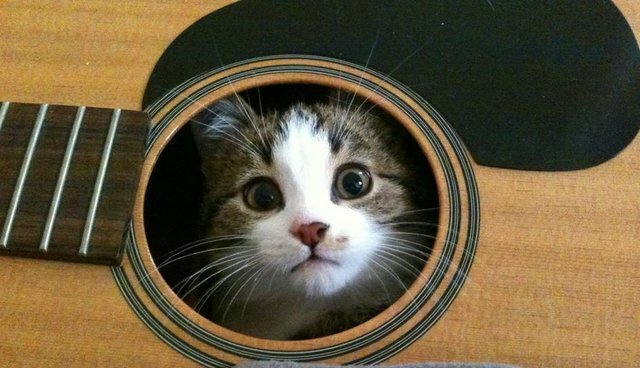 In a few years, you could be taking your kitty to a sold-out cat concert.